The United States Air Force's novel robotic X-37B space plane is tucked inside thebulbous nose cone of an unmanned rocket and poised for an evening blastoff fromFlorida tonight on a mission shrouded in secrecy. The spacecraft, called the Orbital Test Vehicle, ispoised to launch atop an Atlas 5 rocket from a seaside pad at the CapeCanaveral Air Force Station in Florida. Liftoff is slated for sometime during anine-minute window that opens at 7:52 p.m. EDT (2352 GMT). There's an 80 percent chance of good weather to launchthe X-37Bspace plane. But what it will actually do in space and when it willautonomously fly itself back down to Earth remain a mystery. The Air Force would like to keep it that way. At leastfor now. "On this flight the main thing we want to emphasizeis the vehicle itself, not really, what's going on in the on-orbit phasebecause the vehicle itself is the piece of news here," Payton said. The on-orbit tests, Payton said, are classified like manyAir Force projects in space to protect the nature of the X-37B's "actualexperimental payloads." But the X-37B is designed to stay in space on missionsthat last up to 270 days long. For this first test flight, the Air Force wants to see ifthe X-37B, which resembles a miniature space shuttle, can actually launch intospace, open its payload bay and deploy a set of solar panels to keep it poweredfor months at a time. ?This demonstration flight is also aimed at testing theX-37B spacecraft's ability to fly itself back to Earth and land on a runway atthe Vandenberg Air Force Base in California. The key question for the Air Force: How expensive and howmuch work will it be to turn the X-37Bspaceship around for a second flight? If the answer is "too long andtoo much" it may affect when the X-37B and its sister ship ? a secondOrbital Test Vehicle already contracted by the Air Force ? fly again, if ever. "If that's the case, it makes this vehicle much lessattractive to the future," Payton said. Currently, the Air Force envisions launching the secondX-37B, presumably the Orbital Test Vehicle 2, sometime in 2011. 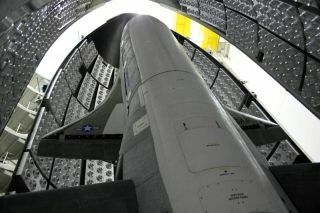 The X-37B Orbital Test Vehicle 1 was built by Boeing's Phantom Works divisionin Seal Beach, Calif. It is about 29 feet (9 meters) long and has a wingspan ofjust over 14 feet (4 meters) across. It stands just over 9 1/2 feet (3 meters)tall and weighs nearly 11,000 pounds (4,989 kg). This SPACE.com X-37B graphic illustrates some details of the space plane and its relative size. When compared to NASA space shuttles, which can weigharound 100 tons when fully fueled and loaded with cargo, the X-37B seems like adiminutive cousin. NASA space shuttles are 122 feet (37 meters) long and have78-foot (24-meter) wingspans. The X-37B has a small payload bay about the size of apickup truck bed. Each NASA space shuttle has a 60-foot (18-meter) payload baythat can fit a large bus inside. But Payton described the X-37B as "one generation beyondthe shuttle." Instead of the space shuttle's fuel cells to generatepower, which need a supply of liquid hydrogen and oxygen, the X-37B has a solararray and lithium ion batteries. It does not have a robotic arm, but may in thefuture be capable of rendezvousing with satellites or retrieving them fromorbit. The spacecraft was actually dreamed up by NASA in 1999 asa way of testing new technologies for reusablespacecraft. NASA passed the project off to the Defense Advanced ResearchProject Agency (DARPA) in 2004, when funding dried up. The program changedhands again in 2006. That's when the Air Force took over. "After a tumultuous history of sponsorship, it'sgreat to see the X-37B get to the launch pad and get to space," Paytonsaid. When it's mission is over, Air Force flight controllersplan to send the X-37B prototype the re-entry order and then hope that itsuccessfully flies itself through Earth's atmosphere and lands safely atVandenberg. Edwards Air Force Base in California's Mojave Desert is the backuplanding site, Payton said. But when that re-entry and landing occurs is anyone'sguess, even within the Air Force. "In all honesty, we don't know when it's coming backfor sure," Payton said. "It depends on the progress we make with theon-orbit experiments and the on-orbit demonstrations."